Do you hate being ignored? Wouldn't it be nice to have the power to cause earthquakes whenever anyone pretended not to hear when you suggest that everyone go grab some tacos? That would teach people to ignore your carne asada cravings. Though they are old, powerful, and wise, the gods of Olympus are known for being petty. We can understand how Poseidon (or Neptune if you're Roman) would feel a little left out. Though his life was interesting, riding around the ocean floor on his chariot pulled by a team of underwater lobster-like horses called hippocampus (what's the plural of hippocampus, hippocampi?) he must have been quite lonely at times. It's said that even though he had a gorgeous palace at the bottom of the sea made of coral and gems he spent more time at Mount Olympus. Just goes to show that all the ocean-voyaging chariots and coral castles in the world can't replace family. It's easy to get ready for your Mount Olympus debut these days. You don't even have to achieve twelve labors like Hercules had to.</p. 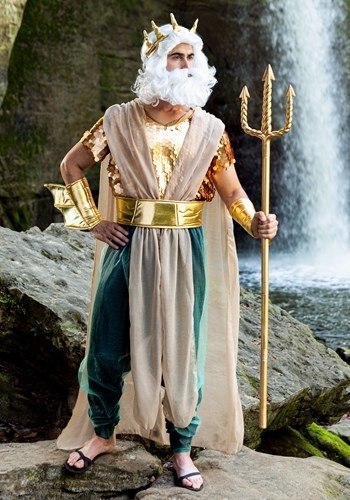 The wonders of the internet can now endow you with all the trappings you need to become like the great Poseidon. In the dramatic golden cape and sea foam green pants, all the ships of the sea will be at your mercy. 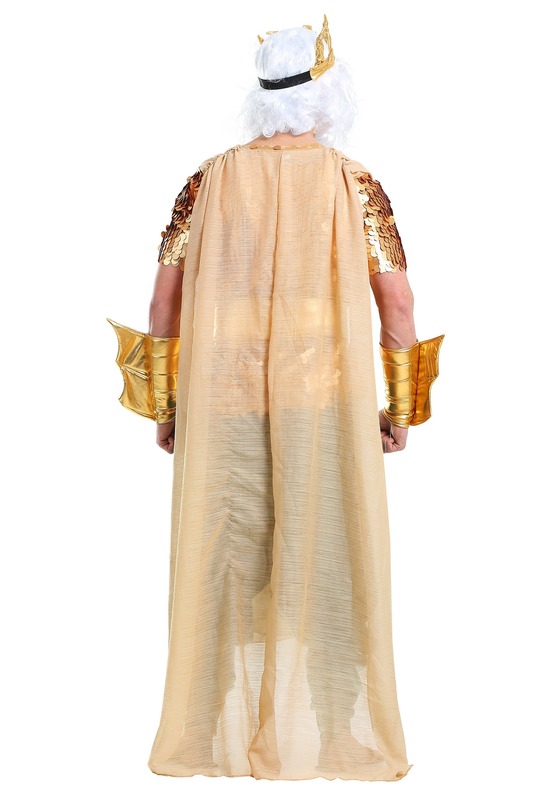 You'll look regal in the golden arm gauntlets, belt, and the gold fish scale shirt. All you need now is your golden trident to take this ensemble from dramatic to earthshaking. This Halloween those mortals won't dare ignore you. If they say no to tacos this time go ahead and make the earth quake.